Raouché (Arabic: الروشة‎, translit. ar-Rawše‎) is a residential and commercial neighborhood in Beirut, Lebanon. It is known for its upscale apartment buildings, numerous restaurants, and cliff-side cafés that line Avenue de Paris, which forms part of the Corniche Beirut. The corniche or the wide, seaside sidewalk of Avenue de Paris is popular on weekends and evenings where strollers and joggers crowd the pavements. Off the coast of Raouché, there is a natural landmark called the Pigeons' Rock or Sabah Nassar's Rock (also known as the Rock of Raouché). 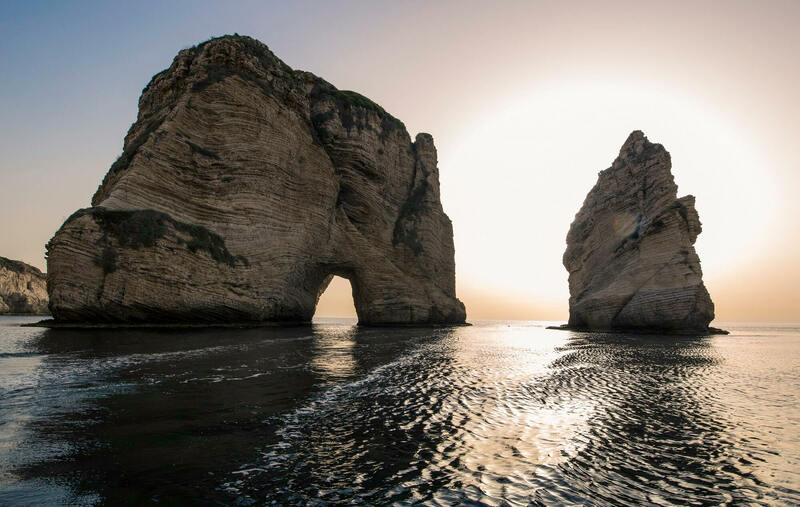 Located at Beirut's westernmost tip, the two huge rock formations, which stand like gigantic sentinels, are a popular destination for locals and visitors alike. Some historians believe that the word "raouché" derives from the Aramaic word rosh or Arabic word ras, both meaning head. Other historians argue that it is a corruption of the French word roche (rocher), meaning rock.